The entrance facade gives only a hint of the magic and grandeur waiting beyond the secured gate, under the shade of the Banyan trees. Stroll down the garden path, with its mature foliage and utter privacy to enter an enormous courtyard gathering space. Complete with plunge pool, an extensive outdoor kitchen, living and dining areas, here is the ideal atmosphere to revel in the sultry warmth of the south Florida sun. Above the garage is a cozy studio apartment, perfect for a variety of situations. 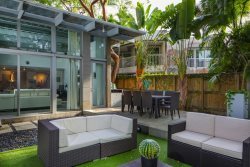 A private patio under the trees provides a secluded living space, while the interior offers a queen bed, a full bath featuring a tiled tub/shower and a kitchenette with a sink and under-counter refrigerator. A built-in desk makes a wonderful escape for the budding artist or writer. A flat screen TV offers entertainment. The main home offers an abundance of natural light through two-story floor-to-ceiling windows looking over the courtyard. Clean lines, tall ceilings and the large, open-concept living space promotes a hip, industrial vibe. Bright and colorful artwork adorns the vertical space, providing a visually compelling contrast to the clean white walls. A welcoming living room invites guests to unwind and relax on the plush sectional sofa or coordinating occasional chair perfectly positioned in front of an HDTV with a surround sound bar. Here, a movie night in turns into a home theater experience. The rare cool evening offers the opportunity to use the gas fireplace for a warm and cozy ambiance. A small additional outdoor area sits just beyond the dining table for 6. Enjoy a glass of wine or some quiet conversation here as the muted evening warmth envelopes you. The center island boasts seating for four, offering additional room for group entertaining. The thoughtfully executed kitchen offers the epicurean ample storage and work space, stainless steel appliances, with dual dishwashers and an oversized refrigerator. The most magnificent of culinary creations are sure to emerge from this enviable space. An elegant and timeless treat in the midst of this modern living space is a Steinway piano. What could be finer than an evening serenade by an accomplished pianist providing a night of unforgettable entertainment? Tucked away behind the living area down a corridor are two comfortable bedrooms. The first features a queen bed and a private HDTV with a sound system. Slip outside for an hours’ entertainment at the table tennis outside your door. The second bedrooms acts as a hybrid bedroom/office. Here, a twin bed with a trundle and an extensive desk and shelving/storage system share the generous space. These two bedrooms share a hall bath with an oversized walk-in tile shower. Upstairs is a master sanctuary, with a private balcony in the trees, floors of gleaming hardwood, a large HDTV with accompanying sound system and views among the treetops. A king size bed offers restful slumber and the spa bath offers an oasis to savor. Here, you’ll indulge in dual vanities, a bidet, a massive tiled shower with a large built-in bench and a soaking tub overlooking the abundant green space outside your window. You’ll emerge rested, pampered and ready for the next adventure in your vacation journey. A second bedroom on this level acts as a den, with a comfortable sofa and HDTV. Here is a lovely escape in which to read a few pages in your book, catch up on social media or simply enjoy some quiet time. Should you wish to escape this magical oasis for a day of sightseeing or shopping, your vacation home is a just short walk from the famed CocoWalk. Home to shops, restaurants, a movie theater and even a fitness center, CocoWalk has been a staple in the Coconut Grove neighborhood since 1990. It is currently undergoing extensive renovations making it an even more family and community-friendly destination. This property, with its multiple dwellings and extensive outdoor courtyard space, is a uniquely exclusive offering in the south Florida vacation rental market. Gather your group and make it your next destination.